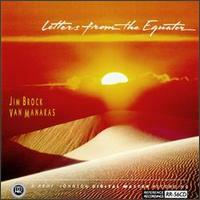 Master percussionist Jim Brock is back with a new partner, guitarist and composer Van Manakas, and a new album, featuring many of the cast of "Tropic Affair." This time, the grooves are hotter and more upbeat, with all-original material reflecting influences from many ethnic music, Latin among them. Hear everything from intense fuzz-tone guitar to smooth jazz ballads, all colored with Brock's tasty, imaginative battery of percussion full of astounding whomps and delicate tinkles. Not the lease of the sonic thrills is provided by a giant seven-foot gong, saved for the last item. Jordan comes as a surprise out of nowhere: one of the most haunting, unforgettable musical journeys it has been our pleasure to hear. "Letters From The Equator": is a multi-faceted conucopia of musical and sonic delights, sure to fascinatte anyone with an open musical mind.